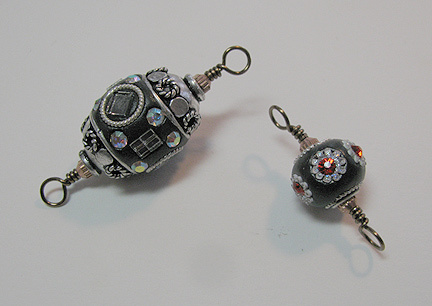 Beading Arts: Easy Maruti bead necklace for spectacular gift giving! Easy Maruti bead necklace for spectacular gift giving! 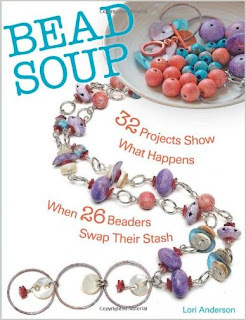 I really enjoyed reading through Lori Anderson's new book, Bead Soup, as I told you before in my review. The very first project reminded me about a technique that I've used often, but perhaps haven't given enough credit to: making wired links out of a selection of one-of-a-kind beads, and then attaching them all together with jump rings to make a beaded link chain. Thank you for the memory jog, Lori! This turned out to be the perfect technique to use with the gorgeous Maruti and Kashmiri beads that I received from Maruti Beads. I received one single bead of each style. 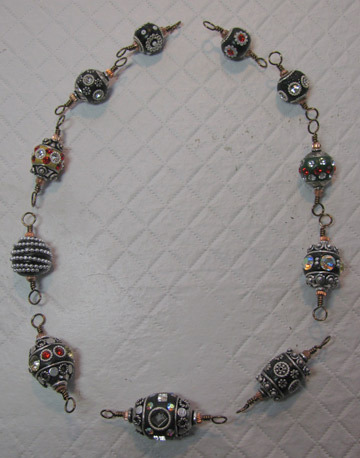 In this necklace, I used mostly Maruti beads (the ones with the large silver bead caps built in), and supplemented with a few Kashmiri beads (without the large bead caps). 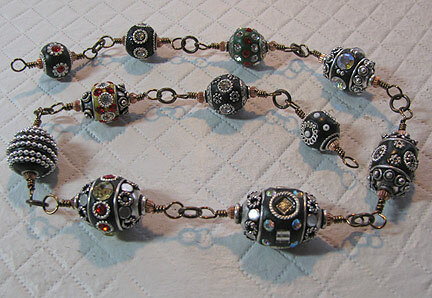 I used a mixture of silver, brass, copper, and gunmetal to pick up all the flashes of color that the beads contain. Fun! 1. 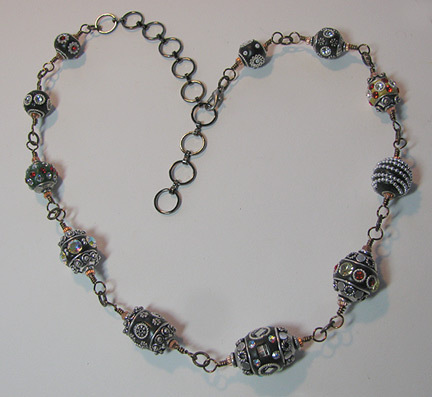 Add small metal beads at both ends of your Indian beads if desired, and turn wrapped loops. 2. Arrange the beads in the order you like. 3. Use a jump ring to attach all of the links. 4. 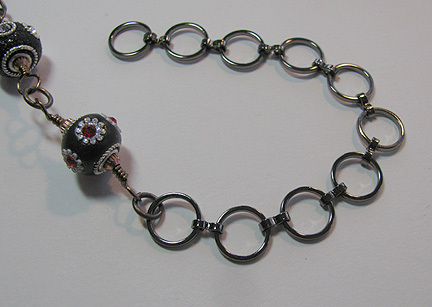 Use a jump ring to attach a length of chain to one end. 5. 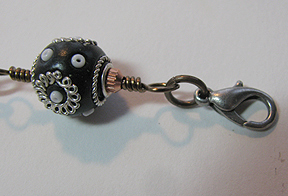 Use a jump ring to attach a lobster claw or other clasp to the other end. As regards FTC disclosure guidelines: I have received beads free of charge from MarutiBeads.com in order to write a review and/or create a project free of charge for you. I have not been paid for my endorsement as it pertains to the products received.